Ankylosing spondylitis (AS) is a form of arthritis that causes inflammation of the vertebra (spine). In severe cases it can lead to the fusing of bones in the spine creating a bent-forward, stooped posture. AS can cause severe, chronic pain, inflammation and stiffness, primarily in the hips and lower back, but sometimes also in the shoulders, hands and feet. AS is more prevalent among men. Mild to moderate cases of AS are often treated with non-steroidal anti-inflammatory drugs (NSAIDs) in an attempt to alleviate pain and stiffness. NSAIDs, however, are often ineffective and long-term use can lead to significant side effects including kidney damage and bleeding in the stomach and intestines. Experts say long-term use of these medications is questionable. Corticosteroids and certain chemotherapy drugs, such as methotrexate, are sometimes prescribed when NSAIDs fail to reduce pain and stiffness. These medications also come with side effects that can be very serious, sometimes even life threatening. Because of this, many doctors only prescribe these for cancer. TNF-blockers are another class of drugs used to treat AS. This class includes the drugs adalimumab, certolizumab pegol, and golimumab. Because of their effectiveness, these drugs are often prescribed for rheumatological inflammatory disorders such as AS. However, these drugs may lead to significant side-effects including reduced ability to fight infection, heart failure, lymphoma (a type of cancer), and neurological degeneration. 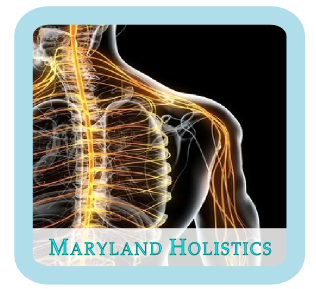 At Maryland Holistics, we offer acupuncture treatment to improve the comfort and quality of life for patients with ankylosing spondylitis. Our treatments can help to reduce the pain and stiffness of ankylosing spondylitis, generally without side-effects. Acupuncture can be used with or without medications. Our practice does not prescribe medications, but we can work with your rheumatologist or other providers to develop a treatment plan or support to your current treatment plan. Our goal is to help restore your health and vitality and promote a deep sense of well being. We have served hundreds of patients with back pain from a wide variety of causes, and many of our patients begin to experience relief within 1-2 sessions. However, for chronic conditions, most patients tend to see greater improvements after several months of regular treatment.